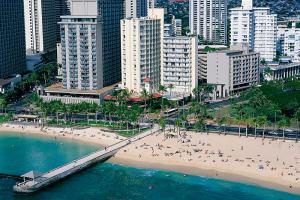 The ultimate location fronting world-famous Waikiki Beach and centrally located between Diamond Head and the excitement of Waikiki. Most rooms have spectacular ocean views and offer the following free amenities: Wi-Fi in the lobby, mini-refrigerator and coffeemaker. Additional hotel amenities include an ocean view pool deck, tour desks, restaurants, retail shops and Starbucks Coffee®. Rates are based on roundtrip air travel to/from Seattle (SEA) and are per person, based on double occupancy. Advertised vacation rate(s) valid for departures 11/30/15.